Today I am going to share my cleaning routine with you. I have experimented with cleaning routines over the years. I have tried zone cleaning - not for me in this season of life. 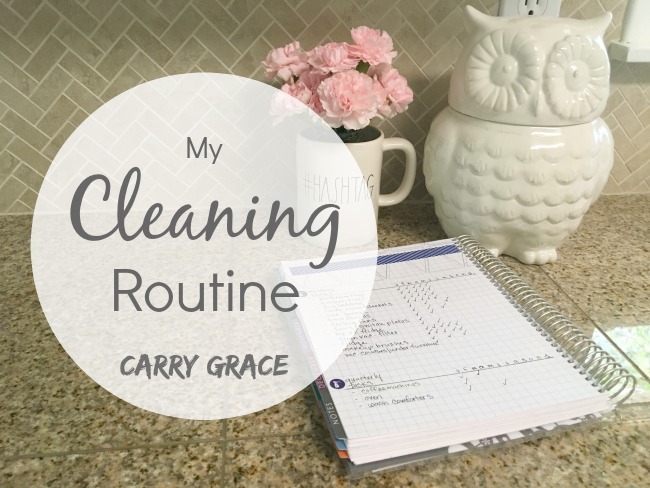 I have tried having a dedicated cleaning day each week, cleaning once every two weeks, and breaking down all of my cleaning tasks down and doing a little each day. They have all worked at various times, but during this very busy season of life I find that I am doing a combination of them all. I have broken my tasks down to Daily (routines), Weekly, Monthly, and Quarterly tasks. 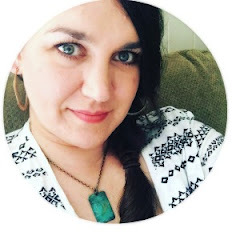 I'm sure that there are more things I should be doing each quarter, but I gave myself plenty of room to add them to my list as I come across things that need to be done. I find that making the daily tasks part of my daily routines are very beneficial for the flow of our day. 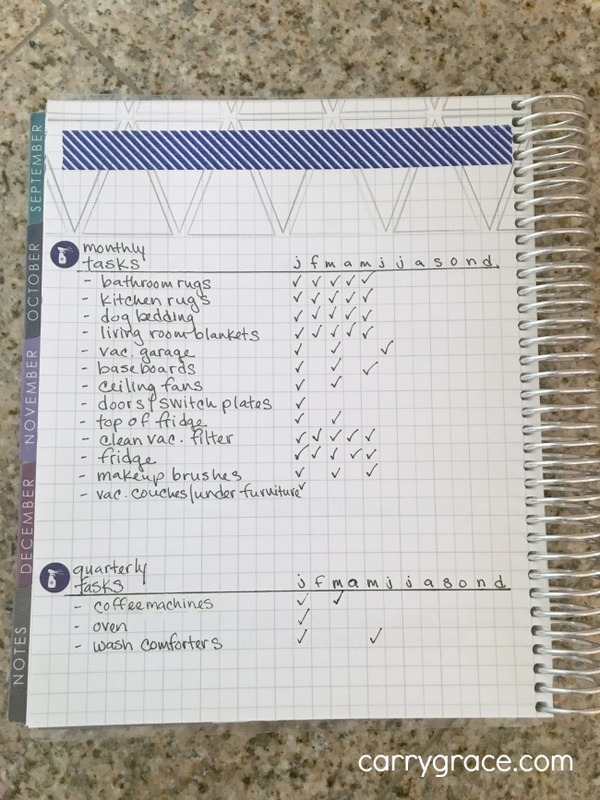 The weekly tasks are the things that I would ideally get done each and every week. 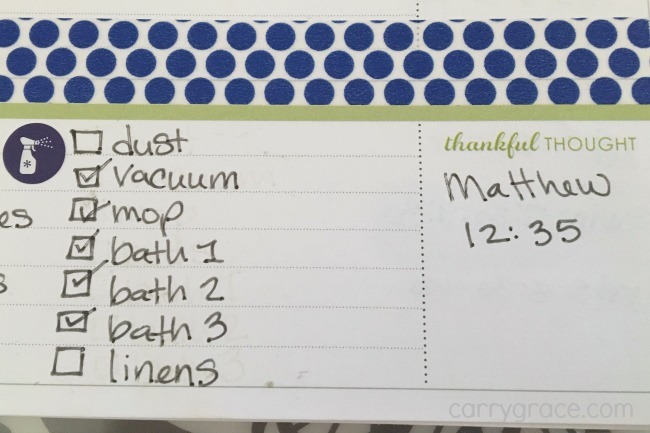 I prefer to get all of these tasks done on Tuesday, but sometimes if we have a lot going on, or our homeschool day runs long, I switch days or divide the tasks up as I have time to get them done. I don't write this in my planner on a specific day anymore. Some weeks everything goes really well, other weeks I skip dusting, or vacuuming upstairs, or our cleaning our shower, and just make sure that it gets done the next week. Cleaning is important, and I do plan around cleaning most weeks, but it is not my #1 priority. I have learned that in this busy season of life I have to be a little bit flexible. I don't have designated times set aside to do these monthly cleaning tasks. I refer to my list as I have free moments during the day and pick something to tackle. It is very unlikely for me to complete each task every single month. I do keep up with it in my planner so that I can prioritize what needs to be done. Let's talk about cleaning routines in the comments. Do you have cleaning routine that works well for you? Thanks for sharing this, I love hearing how other people clean. Just watched your video, too!